Every so often, a bloodcurdling tale of how a young child has been mauled by a family pet dominates the news. Thankfully these attacks by dogs on babies are rare, but the consequences are unthinkable and parents must be aware of potential dangers and take the necessary precautions. 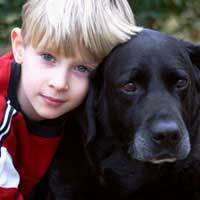 All dogs need supervision when young children are around, as even the most tolerant dogs can be bad tempered or unwell at times. Babies cry and flail, which can make dogs anxious and unpredictable, and curious toddlers who do not know any better can tug or poke at dogs. Safety gates can be used to keep children and pets apart for at least some of the time. If possible, take steps to prepare the dog before a new baby joins the family. Cut down on the number of walks the dog has and the amount of attention it gets, as even pet owners with the very best of intentions will struggle to stick to the old routine once a baby is born. If these changes can be made in advance, the dog will not associate them with the baby's arrival. If the dog has any bad habits, such as jumping up, work to improve its behaviour. Try to teach it to be quiet in the house, and keep it out of the room that is to become the nursery. If the dog has shown any aggression in the past, by killing cats or other animals, or does not get on with children, seek expert advice. Make sure the dog is wormed and flea-free, and, if it gets the run of the garden, use a pooper scooper before allowing the child outside. Consider fencing off an area of the garden for the dog, so that the remainder is a safe baby area. Cats are less likely to be aggressive, but it has been known for a cat to smother a baby sleeping in a pram or cot. These rare accidents are due to the appeal warm areas - like prams and cots - have to cats, so keep the cat out of the nursery and use a cat net on the pram or pushchair. The upheaval caused by the baby's arrival may cause the cat to reassert its rights by changing from facial gland marking to urine spraying, which is extremely unpleasant with a new baby in the house. Make sure the cat is flea-free and use a safety gate to keep cat food and litter trays out of reach once the baby starts to crawl or walk. It has been known for curious babies to use a cat flap to escape from the house, so keep it locked while the baby is about. Also, although most cats will just run off if a toddler who does not know better is teasing or hurting them, some will scratch and bite, so watch out. Parents who do not have pets when the baby arrives should wait until the children are old enough to understand that animals need to be respected before adding a dog or cat to the family. Better pets for young children are guinea pigs or rabbits, as these pets do not have to live in the house all the time. They can live in outdoor cages and the children can handle them for short periods of time under a parent's supervision.